Hello, all! 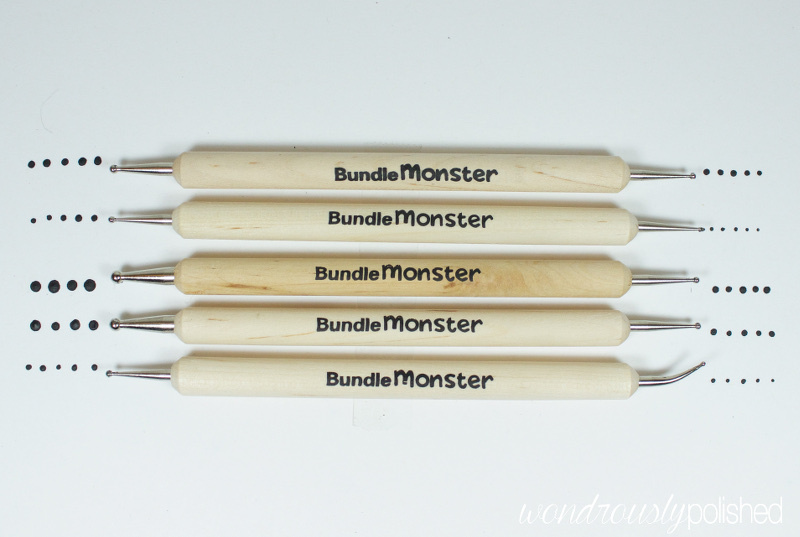 I've got a review of a very popular Bundle Monster brush set to share with you all today! When you first start getting serious about nail art, one of the most exciting purchases is your first set of nail art brushes! My first set of nail art brushes seriously opened up my nail art world. Until brushes, I had been using striping tape or fumbling my way through using toothpicks...and while there is nothing wrong with using those tools, they are definitely limiting. 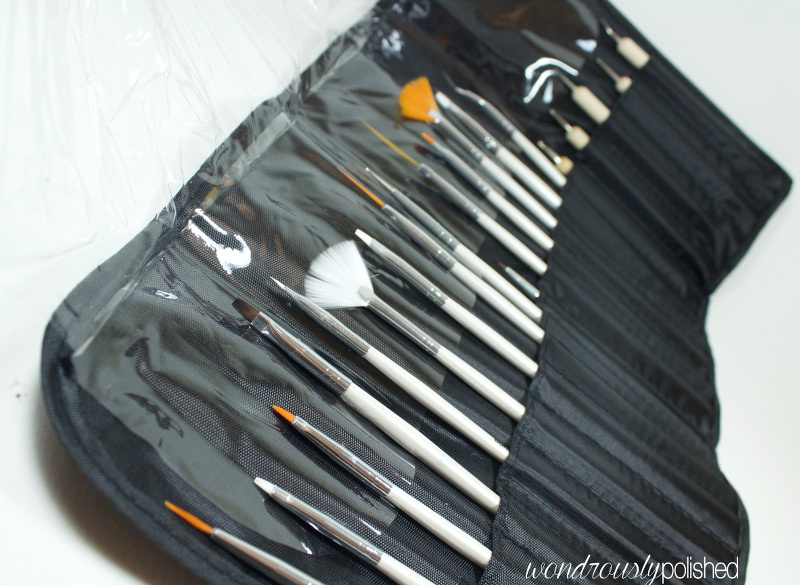 The first brush set I owned actually looked very similar to the Bundle Monster brush set shown here, though the one I purchased was a super cheap version that took the long boat from China to get here. I remember spending a good amount of time comparing the two sets online, but since I was just starting out and already spending too much on nail polish, I settled on the cheaper set of brushes over the pricier Bundle Monster set. So, my review today has my experience with that original set in mind; basically, I wanted to see if the BM set was worth the price tag. My initial reaction to the set is yes, I do think it's worth the bigger price tag. 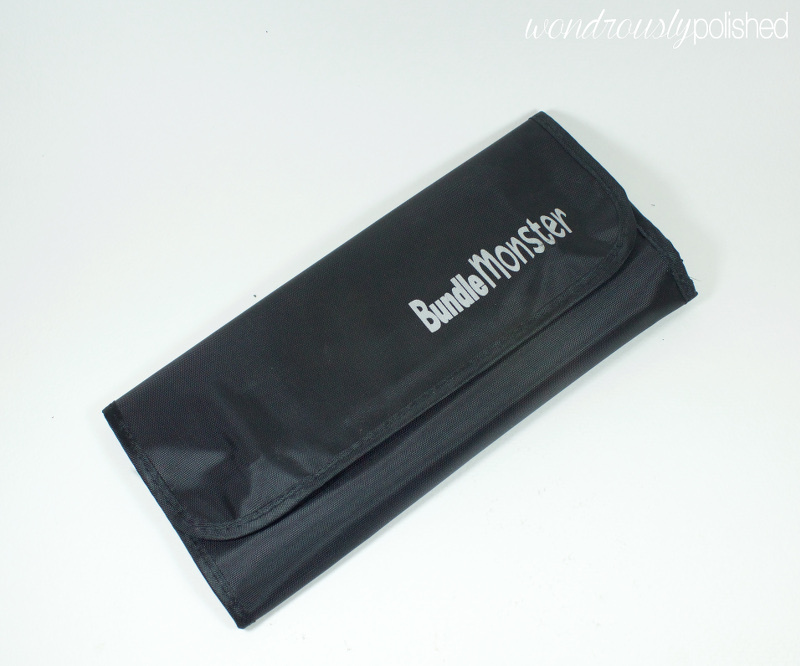 It comes in a convenient and nice quality carrying case, and everything from the packaging, to the brush handles, to the brush hairs felt sturdier and of better quality than my original set. 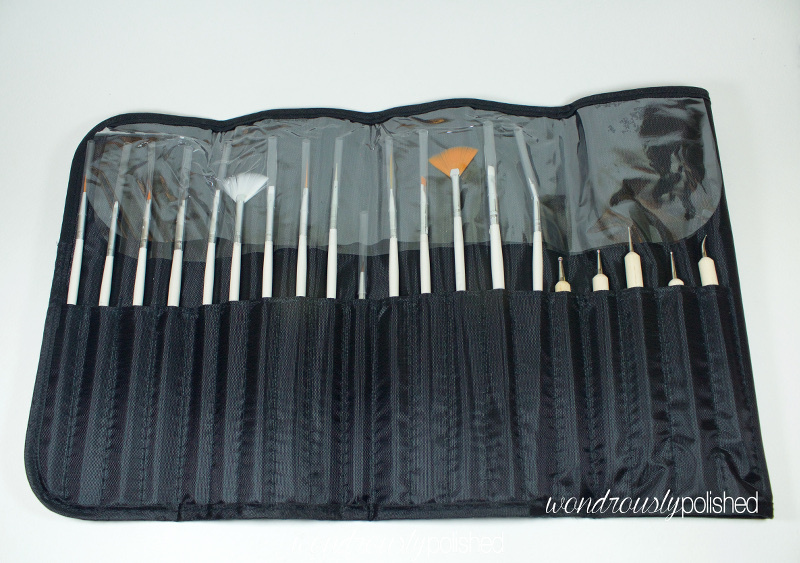 There are a total of 14 brushes, one small dotter with a brush handle, and 5 double ended dotting tools in this set. It's a great starter kit and has everything a new nail artist could ever hope for. Usually you have to purchase the brushes and the dotting tools separately, so I really liked that these were included in the same set together. I'll break up the brush set into their various potential uses in nail art. 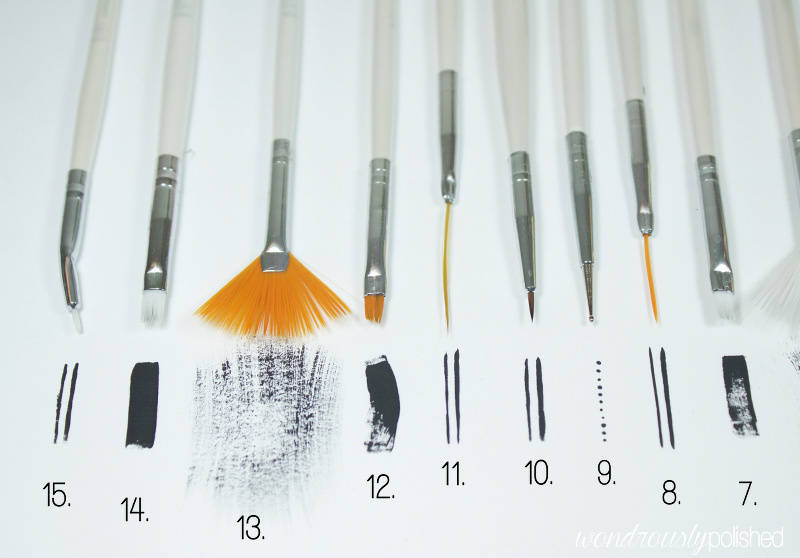 There are some brushes in this set that I straight up have never used (or figured out how to use) in nail art, but most of these I have utilized in one way or another so I'll share the way that I have used them (meaning, you may find other uses for them). For the line work shown, if there are two lines for the brush, the right line shows the line you'll get if you let the brush's full width drag on the paper and the left line is the line you can get when you use a lighter application. If you're looking to do some freehand nail art and paint more intricate and detailed things, these brushes will be your best bet (and even 8 or 11 of you can handle the length). I liked these detailing brushes a lot and think that 1 and 10 were my favorites. While 15 is usable, I wasn't a fan of the angle in the brush. 3 was also nice, but it's much larger. 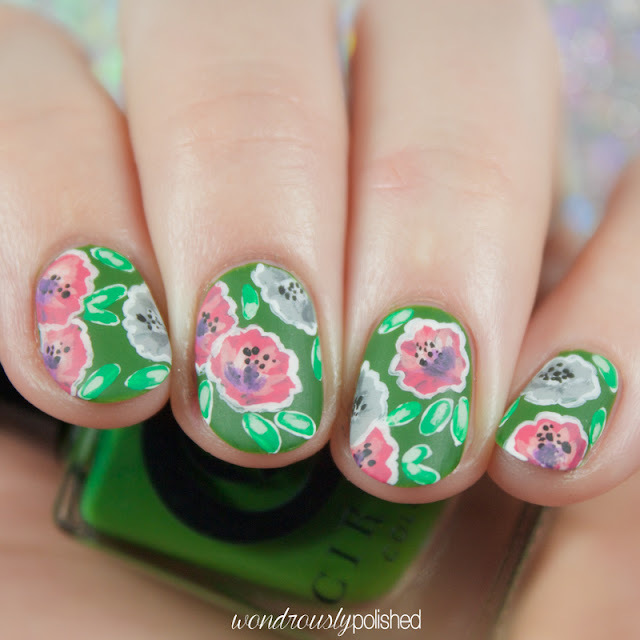 This would be nice for creating flower petals or something where dabbing on polish is required. 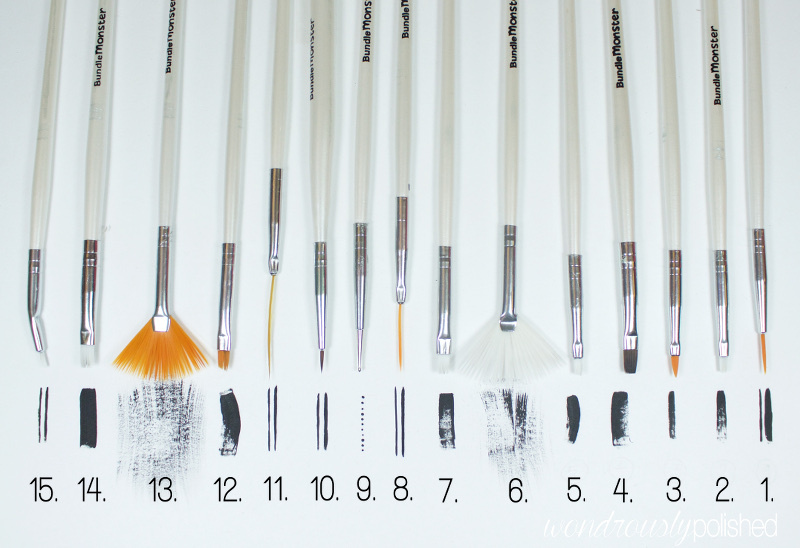 These are you pretty standard striper brushes, with 11 being the slimmer and longer version of 8. Both of these were very easy to use and all the bristles were in line and created a nice and smooth line. I really like these and they'll fit nicely into my brush routine. There is quite a diverse grouping of square brushes in this set (personally, I'd prefer a few more detailing brushes over this many square brushes) and each of them varying in either size, or stiffness. Any of these would be nice for dry brushing or creating various textures on the nail. I also find myself using these when I've got a large area to cover, but I want more of a textured finish to the coverage. I've personally never figured out how to make the one-stroke flower work for me so I end up using these angled/chisel brushes for clean-up around the cuticles once I'm done with a mani. This is such an important step in your nail art routine and every good nail artist covets their clean-up brush. Lately I've been using brush 12 for my clean-up. These two brushes are among the ones that I've never found a use for. 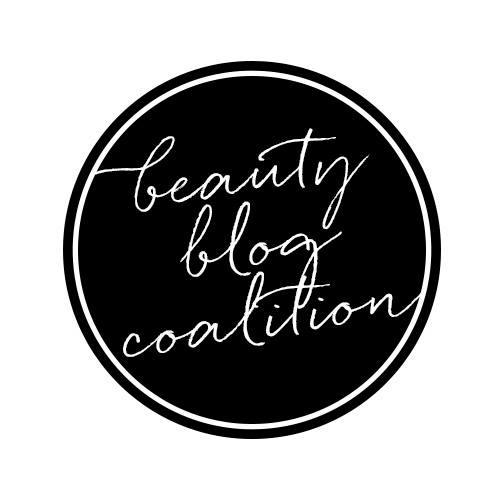 I know there are many blogger that utilize them, but I've yet to make art with them. They seem nice, though, and 6 is definitely a bit of a stiffer brush than 13. Also included in this set are 5 doubled ended dotters. I think this is a good set of dotters and like that most of them are on the smaller side. However, it does seem like a few of them are very similar in diameter and a few of them create almost the exact same dot. I also put together a little nail art look (inspired by this pinterest image) using a few of the brushes in the kit. 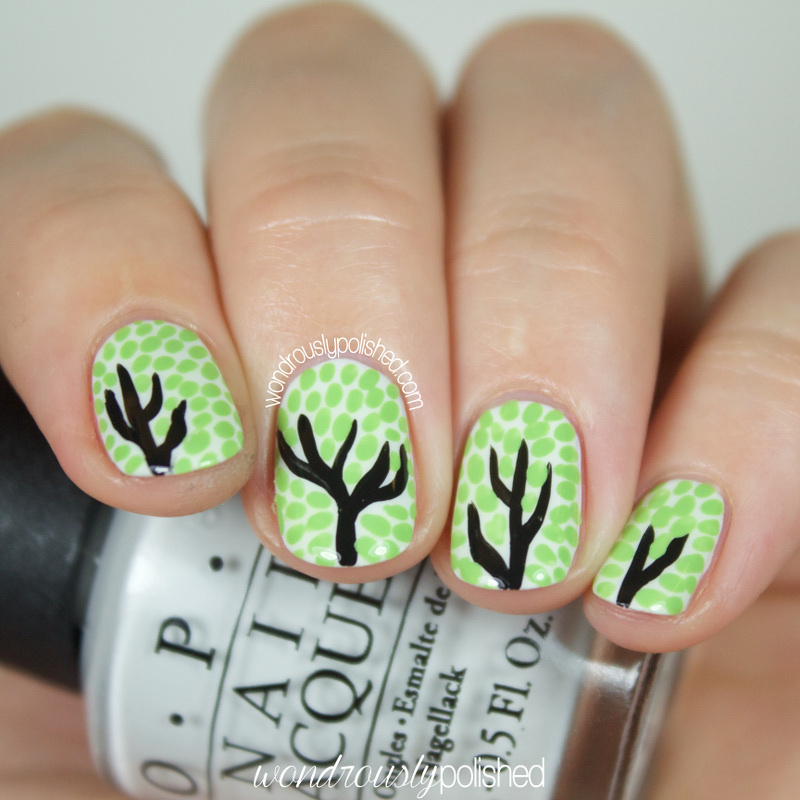 These are supposed to be trees (or, since it's almost Halloween, I suppose the could be cracked, scaly skin??) and the tree trunks were painted with the number 1 brush. The dabs of the leaves were done using the 3 brush and I did all of my clean up around the cuticles with the 12 brush. Some things to keep in mind...while I feel that this set is of better quality and nicer in general than the cheaper version, it is entirely possible that I'm falling for the better packaging done by BM and that there really isn't much difference between BM and the cheap set. I haven't lived with or used the BM set long enough to say how well it handles the abuse of acetone and polish on a daily basis...I do have high hopes though and think they're going to stand up great to the things I put them through! Overall, I think this is a really great starter set of tools. I like the carrying case that it comes in, and think that it is overall worth the higher price tag. I do wish some of the brushes were smaller/thinner, but they are still very usable. 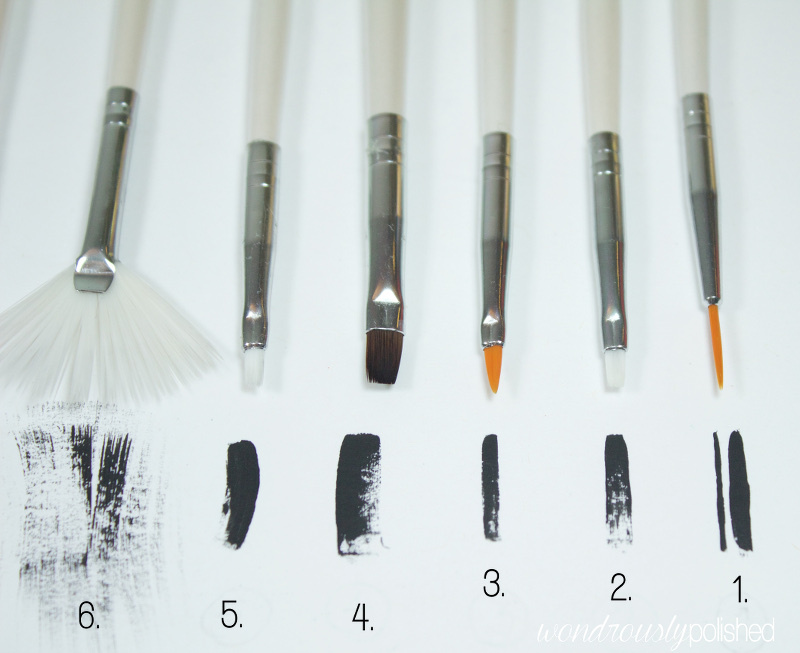 If you feel comfortable trimming your brushes, these also have potential to be trimmed down. If you can swing it, I think these are worth it. You'll have fast shipping and some good quality brushes to get you going on your nail art journey ;) You can purchase the set directly from Bundle monster here for $13.50. Be sure to check out Bundle Monster on your social media sites! The Digital Dozen - Spooky Days Giveaway!